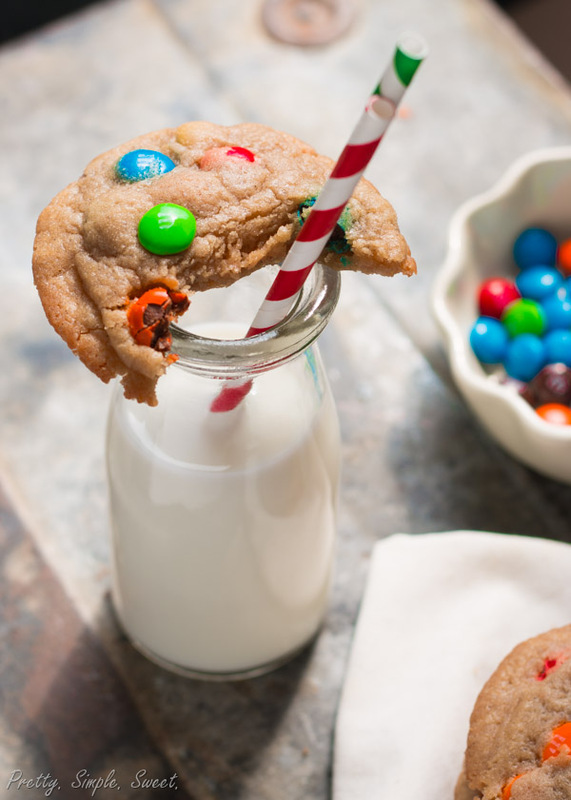 M&M Cookies | Pretty. Simple. Sweet. 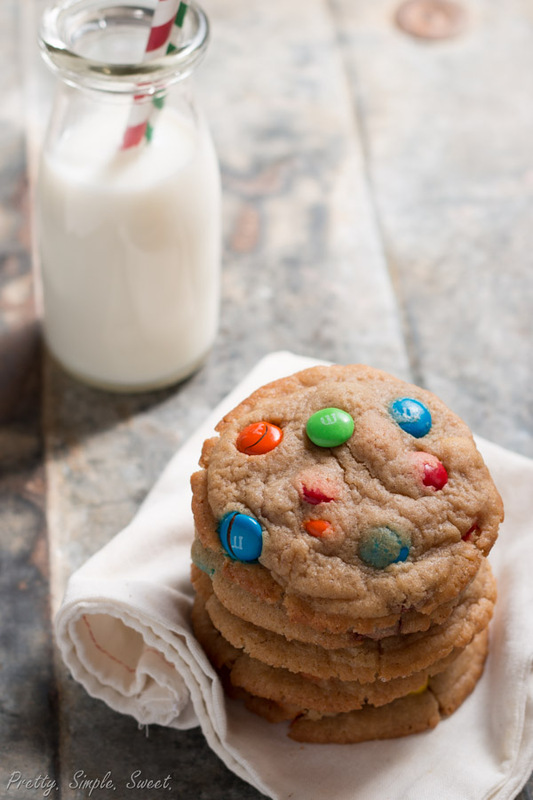 Big, soft, chewy M&M cookies that not only look fantastic, but taste even better! I’ve realized something this week: I spend a ridiculous amount of time at the grocery store, especially in the baking isle. 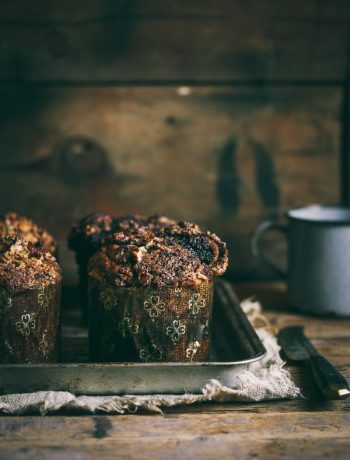 Although I know every ingredient’s location by heart, I tend to stare at the groceries for about 10 minutes, hoping a magical new ingredient will pop out from the shelves and give me creative ideas for my next new dessert. The workers there keep asking if I need any help finding something. I’m sure they think I’m weird. You know what else I’ve realized? When it comes to ingredients I like to bake with, I’m a sucker for deals. I even go after the bad ones, like “Buy 3 and enter a competition to win a trip around the world!” or “Buy 17 bags of M&Ms and get one free!”, which is exactly what happened this week, by the way. Ok, maybe not 17 bags, but still more than I needed. Thank goodness there are cookies for just this kind of occasion! You can add ANYTHING to a good cookie batter and it will taste delicious. Even bacon. 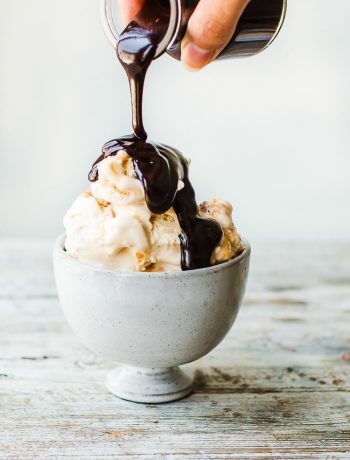 So let’s talk about that good cookie batter recipe – this recipe. 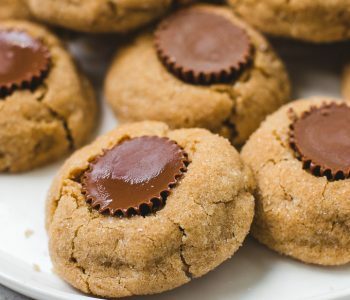 It produces soft, chewy, and ridiculously delicious cookies. These cookies are also big. 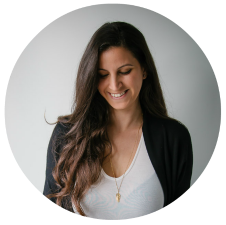 They’re not giant, but they are big enough to stop my cookie craving – and this is me we’re talking about. Of course you can make them smaller, but why would you want to? In my chocolate chips cookies post, you’ll find all the information you need about the secrets to making perfect cookies and why this recipe works – although it’s based on Baking Illustrated’s recipe, so of course it works! If you like thick cookies, then please please please don’t skip the step of chilling the dough. This specific recipe uses melted butter, so the dough is really soft. I know it’s hard and not very fun to wait, but it’s worth it. With that being said, of course you can bake the cookies right away, but they might spread out more than if you had chilled them. If you like soft cookies, don’t wait for the cookies to appear dry before taking them out of the oven. Even if they look extremely soft, they will firm up once cooled. The middle should appear under baked with the edges having just begun to brown. 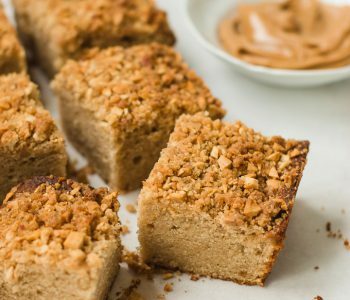 This makes all the difference in the world between a crunchy cookie and soft, chewy goodness. In a large bowl, place the melted butter, granulated sugar, and brown sugar. Whisk until well combined. Whisk in the egg, egg yolk, and vanilla extract. Add flour mixture and mix just until combined; do not over mix. Fold in M&Ms. Chill the dough for a minimum of 2 hours, preferably 6 hours or overnight (or up to 3 days). Preheat oven to 325F/165C. Line pans with parchment paper. If the cookie dough is hard to handle, leave it on the counter for a few minutes to soften. Drop rounded balls of dough, around 3 tablespoons in size each, onto prepared baking sheet. Press extra M&Ms into the tops. Bake for 10-12 minutes, or until cookies begin to brown at the edges and the center is still soft. Cookies will appear undone but will continue to bake on the warm baking sheet. Leave to cool for 10 minutes, then transfer to a wire rack to cool completely. Cookies can be frozen for up to 2 months. Hi Germaine! In all my recipes, I use unsalted butter, unless I mention otherwise. Can I just grease the cookie sheet instaed of using parchment paper? Yes you can, or you can use a silicone baking mat like this one, which is amazing. 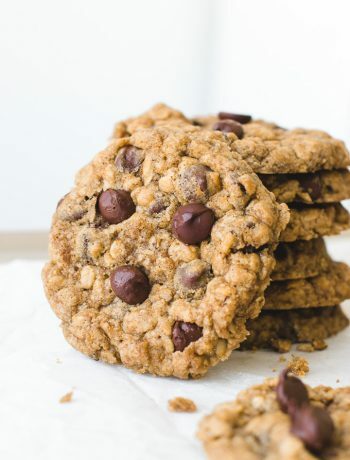 Parchment paper would prevent the cookies from sticking to the bottom, so you won’t need to scrub the cookie sheet, but that should be fine for these cookies. I used a very well seasoned baking sheet and they came out excellent. No parchment. No butter or oil. Hi! To make a round ball of dough, all you need to do is take a piece of dough and make a ball out of it, by rolling it between your hands. You don’t need to flatten them at all as they would spread during baking. If you need more help just let me know! Hi is it ok to put in two eggs and 2 1/2 cups of flour? If you prefer using 2 eggs, you can use the cookie dough from this recipe. 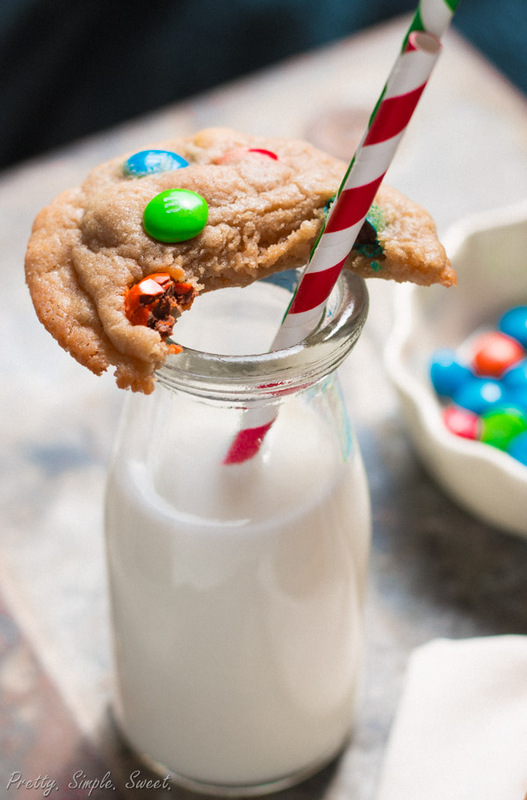 Omit the Oreos and add 1 cup M&M’s. Hi Tarsha, I’m guessing that either the cookies were bigger in size than what the recipe suggests or that your over temperature wasn’t accurate (that happens sometimes). 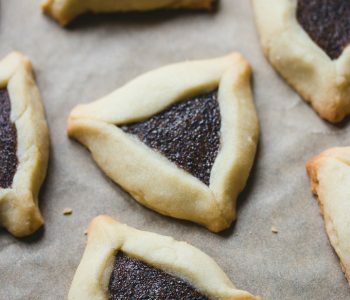 The center should be soft and not fully cooked, but if you prefer crunchy cookies then you should bake them for longer. Hope this helps! Hi Brenna 🙂 All you need to do is place them in the fridge for a few hours to thaw or in room temperature for about 2 hours. Then, either serve them at room temperature or you can reheat them in the oven just until they’re warm. Hi Lisa, you don’t have to chill the dough but it would help in holding the shape of the cookie better and spreading out less during baking. Is it unsalted butter or is baking soft butter (stork)? Hi Ramya, freshly baked soft cookies remain fresh for only 2-3 days. 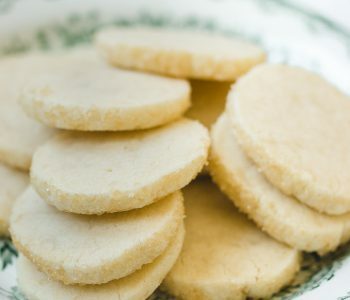 Hard homemade cookies like shortbread cookies stay fresh for longer. Hey! 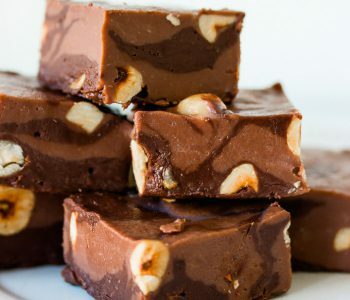 I tried this recipe and I just want to say its simply great! It was my first time making cookies and they turned out great! Thank you for posting this! Thank you so much, Kavya!